Andrea’s Restaurant, 3100 19th St. Experience the joy of prayer and wealth of grace entrusted to praying women with speaker Kathleen Beckman and music by Lorraine Hess. 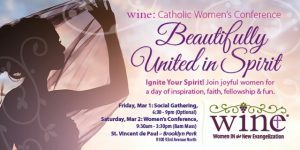 The Daughters of St. Paul and the Gateway WINE Group invite you to join them for a fun & faith-filled evening. 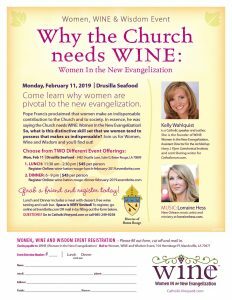 Kelly Wahlquist, foundress of WINE, will be at Pauline Books & Media in St. Louis speaking about WINE. Book signing with "Gaze Upon Jesus" to follow. 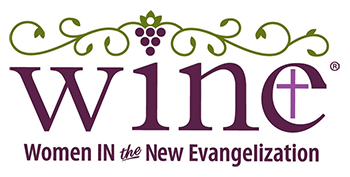 Sacred Heart of Jesus Catholic Church, 708 East Main St.
Come learn why women are pivotal to the new evangelization and how they are radically relational. Steamboat Restaurant, 525 North Main St.
Come learn why women are pivotal to the new evangelization and how they are created radically relational. Join the women of WINE on Thursday, December 4th for Women, Wine & Wisdom, the Catholic Woman's "Theology on Tap," as fabulous Catholic speaker, Liz Lev takes us on an empowering journey through Rome and her history.